The best Happy Hour around Castro Street and Downtown Mountain View. Happy hour in Mountain View, like most other downtown areas in Silicon Valley, is when you get together with a few friends at a local bar or brewpub after work, down a few cocktails or beers and try not to leave the premises too intoxicated. What makes Happy Hour in Mountain View a little different from its Silicon Valley neighbors is the diversity of bars and restaurants on and around Castro Street, the heart of Downtown Mountain View. Known as the city where Silicon Valley was born (Shockley Semiconductor, the first company to develop silicon semiconductors, was established here in 1956), Mountain View is home to some of the largest technology companies in the world, including Google, Symantec, LinkedIn and Microsoft. And every afternoon, employees of these companies flock to Downtown Mountain View's Castro Street area to enjoy a few drinks and bites at one of the city's best Happy Hour spots. Castro Street in Downtown Mountain View. Grab a bite to eat or stay for nightly Happy Hour. Happy Hour is a daily ritual of chilling out after a long workday that dates back to the U.S. prohibition era. Back then, speakeasies would use the term "Happy Hour" to reference the pre-dinner drinking sessions. Though Happy Hour has evolved over the years, it still remains a favorite Mountain View employee tradition. Today, Downtown Mountain View is a Happy Hour hub, with local brewpubs like Tied House offering daily deals on alcohol and grub and a chill place to hang after a day at the office. Tied House is still located in the same location as when it opened in 1988. Downtown Mountain View is now a happening hang-out spot, but the Castro Street area wasn't always the Happy Hour destination it is today. Back in 1988 when the old-school brewpub Tied House opened, Silicon Valley didn’t even exist. 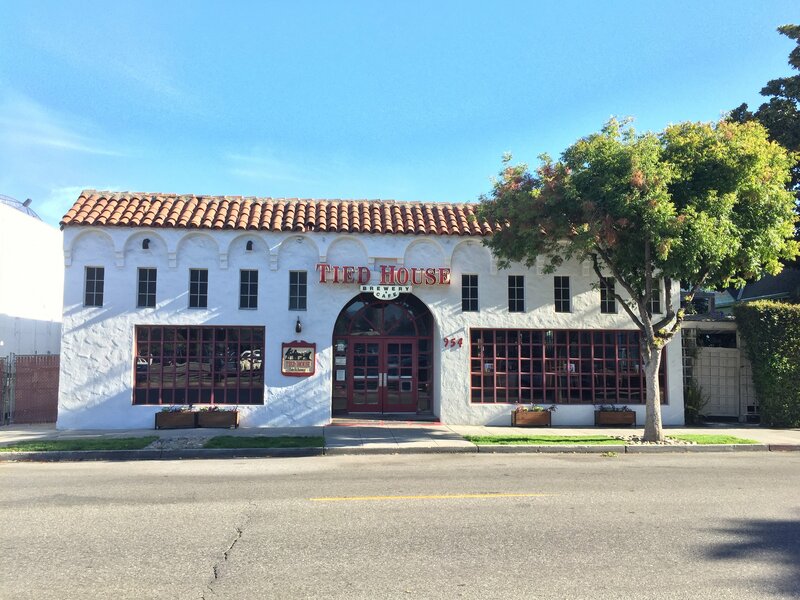 Downtown Mountain View was still in development, and as new restaurants and entertainment began to open in the area, Tied House remained one of the first microbreweries and pubs of its kind on the west coast. Construction for the brewpub broke ground just one year before the City of Mountain View began a $10 million-plus renovation project around Castro Street, which transformed the city’s center into the entertainment hub it is today. 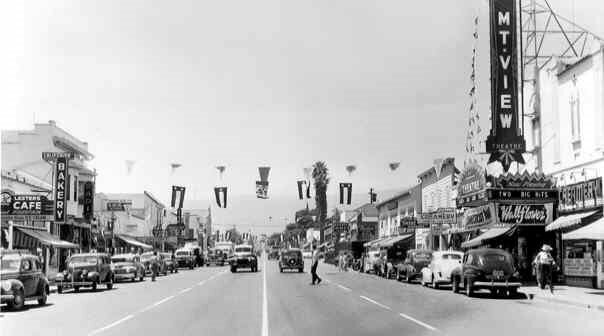 Downtown Mountain View has been a Bay Area destination since it was established in the 1950s, as pictured above. Mountain View grew as new tech companies were established nearby, and the area around Castro Street grew with it. Today, Google, Facebook, LinkedIn and Apple are all located within commuting distance of Castro Street, bringing with them new employees every year to consider Downtown Mountain View their Happy Hour destination of choice. 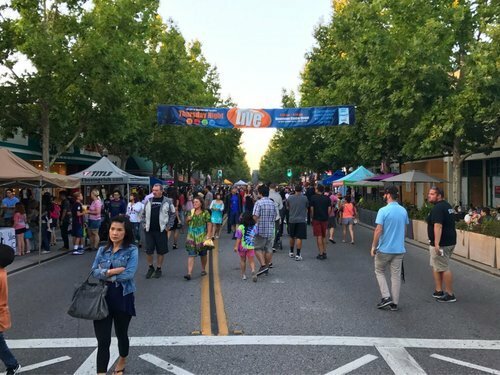 The growing population of the Silicon Valley has increased the demand for entertainment and leisure in downtown areas like Mountain View’s Castro Street. The area now hosts countless restaurants, local businesses, and even a weekend farmers market, but Happy Hour is what keeps the area bustling and relevant. Many restaurants like the old-school Tied House brewpub provide locals with Happy Hour along the seven blocks of Castro Street, stretching from the Mountain View Caltrain station to the busy El Camino Real road. Tied House, Stein’s and Cascal are just three of the countless Happy Hour destinations in the area. This variety of entertainment consistently brings people to Castro Street night after night. Mountain View is of the top downtown districts in the Silicon Valley, hosting entertainment events and happy hour every week. Today, businesses like Tied House are just as much a part of Mountain View as Castro Street itself, providing workers and families with good food, a great atmosphere, and a top-notch Happy Hour. Downtown Mountain View changes as years go by, but Happy Hour at Tied House still remains a favorite for everyone from NASA scientists and Google moguls to young families. Like Mountain View’s Castro Street, Tied House is a piece of old-school California that has something to offer everyone. Head over to Downtown Mountain View and stay a while on your next evening off. You'll be greeted with a great Happy Hour, but the awesome atmosphere and chill California vibes will have you keep coming back. Image sources: MVCoC Foundation, Tied House, City of Mountain View, Skyscanner.